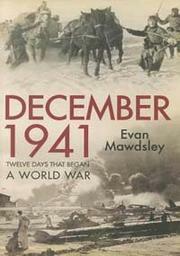 Suspenseful chronicle of the 12 days in December 1941 that would define the perimeters of the global conflagration. Mawdsley (Professorial Research Fellow/Univ. of Glasgow; World War II: A New History, 2009, etc.) embarks on the action from the first day and never lets up in this crisp, chronological study—from the Japanese Imperial Conference’s ratification of war on Dec. 1 against the United States, Britain and the Netherlands, setting in motion the Southern Operation invasion, to Germany’s declaration of war on the U.S. on the 11th. In between, Hitler’s lightning thrust into the Soviet Union was now mired in mud and the approaching winter. In Libya, the British under General Ritchie were driving General Rommel and his Italian allies back from securing the supply port at Tobruk. Yet the essential crisis at this moment was gathering steam in Southeast Asia and the Pacific islands, with the launch of the Japanese invasion convoy on Dec. 4, which struck Malaya and southern Thailand, Singapore, Pearl Harbor, Wake, Guam, the Philippines and Hong Kong. Mawdsley has an excellent grip on the behind-the-scenes political and diplomatic scurrying among London, Washington, Berlin and Tokyo, much of it desperate and, to readers in hindsight, smugly blinkered, as Japan’s hostile intentions were not hidden and the Allies had broken the Japanese encryption in 1940. Crucial code warnings received by U.S. Chief of Naval Operations Harold Stark were not delivered to the Pacific commanders in time. Pearl Harbor brought America into the war, bolstering Britain and turning the tide. Hitler announced in a Dec. 12 speech his resolve to “clear the table” of the Jews; a week later he had taken direct command of the German Army. A rigorous, sharp survey of this decisive moment in the war.